His mother had been abandoned by their father, Moses, in November 1752. 2 At one point in time, she was able to send her fatherless children to the country while she was able to gain some income in a small shop.3 This situation did not last long and Isaiah was apprenticed to Mr. Fowle. 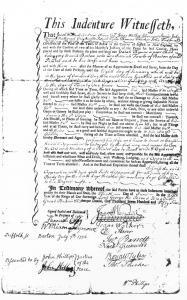 For a transcription of this document please click here.